Some international space leaders may be coming to Puerto Vallarta around September 18 to find out, as part of a planning session here. 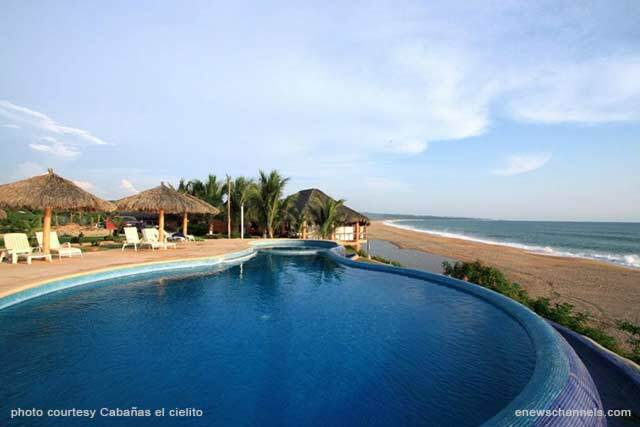 So much is thanks to Carlos VonHauske, my Mexican-German co-founder of Vallarta Saludable and Eco Tourism maestro who raised awareness about NASA scouting this area years ago likely because the Vortex at Cabo Corrientes, two hours from Vallarta, would require less rocket fuel. REF: http://www.vallartatribune.com/2013/10/06/mexico-to-host-international-astro-nautical-congress/. PHOTO CAPTION: (cover image above) Mexico’s Cabo Corrientes Vortex, a magical healing region with rich virgin soil at the South end of Puerto Vallarta’s Magnificent Banderas Bay, may produce the healthiest Organic Superfoods for Astronauts as well as Vallartans thanks so much to Mexico hosting the 2016 Astronautical Space Congress. Photo courtesy Cabañas el cielito. Therefore, Mexico is poised to produce possibly the healthiest Astronaut Superfoods. And along with their guests, Astronauts would finally be able to survive and thrive in deep space while enjoying tastier cuisine. Californians are excited about how some of these technologies, like “Quantum Pulse Irrigation,” using pulsed tones in an isochronic format masked under popular songs on loudspeakers, can also help farmers eliminate the need for irrigation, and help ski communities enhance more snow, so they are also Climate Change solutions. Dr. Servando’s Agro Tech reconnects the subtle light transmissions from the sun and other far-off celestial bodies that provide the primordial quantum data that enlivens our Earth, soil and bodies, since 60% of this critical data is now shockingly blocked by trashed satellite parts in NASA photos. Wouldn’t this also make costly space missions safer? Therefore, we are looking for space programs that would love to partner with our Mexico team to provide these Nano Superfoods for their astronauts, and our Space Junk Recycling Project that could more easily and cheaply collect these expensive alloy scraps to streamline helping restore healthy Life on Earth. Especially given that China, a Space leader, is buying up alloy scraps all over the world. While I am proud that my dad Keen Chaffee built the 30 ft nose cone for Von Braun’s first U.S. two stage missile, I am karmicly helping restore the health of our planet by raising the awareness of NASA, the public and now the other space programs. Kids Urge Ban on Trashing Space to Save Dads and Forests Fortunately, thanks to my dad’s contributions, two years ago the marketing director of NASA shared my ENewsChannels article about Dr. Servando’s insights with her team of scientists. So here is a profitable way to fulfill our responsibility to all our children and the Healthy Future of Space Exploration. And since it will also help save their dads from prostate cancer, and moms from osteoporosis, why doctors now recommend taking Vitamin D, those who make that possible will be their heroes! Through growing these Nano Superfoods for Astronauts, Mexico has a chance to emerge from being ‘No. 1 in Diabetes and Obesity,’ into a vibrantly lean and clean country, and Vallarta a thriving Diabetes Medical Tourism Center. That is because we could also finally grow a lot more nutrient rich organic or biodynamic food for the people of this region, a missing link. And through also leading the space cleanup, growing and extending the freshness of possibly all Astronaut Food, and hosting the first Astronaut Superfood Technology Tours, Mexico may quickly become a respected contributor to the World’s Space Community. PHOTO ABOVE: NASA astronaut Karen Nyberg, Expedition 36 flight engineer, gets some nutrients aboard the International Space Station. Photo courtesy of NASA. 70 SPACE PROGRAMS AROUND THE WORLD! The Economist says that there are now 70 space programs around the world, led by US-NASA, Russia and China. (These 3 Countries Have Huge Space Programs You’ve Probably …) The US space agency alone gets about 17.8 billion a year. (http://news.discovery.com/space/history-of space/nasa-2012-budget-ups-downs-111202.htm) They spend a major chunk of that on fuel to launch the rockets, and since happy, vibrantly healthy alert astronauts are key to safely driving multi-billion dollar vehicles across the universe with no MDs, they naturally want the highest octane superfoods. All the space programs also want to keep their guests happy who help make these space adventures possible, and they are used to great cuisine. NASA says they “make certain Astronauts have the proper food,” yet the 10 favorites meals out of approx 130 they eat in outerspace are surprisingly not known for having super nutritional value, like tortillas, as Mexicans know, unless they are made from Nopal (cactus) or other superfoods, but then the longest space stations tour so far is one year. Yet some meals are for psychological-cultural reasons. http://news.discovery.com/space/history-of-space/top-10-good-space-food.htm. 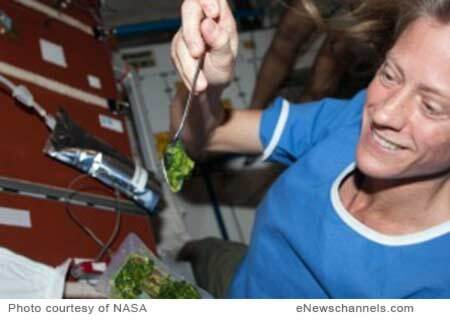 Since space travelers lose bone density at an average rate of 1 to 2 percent a month, (http://blogs.scientificamerican.com/food-matters/30-under-30/), which could put them at risk on return, I was happy to see Astronaut Nyberg eating her greens. Thanks to the prestigious University of Guadalajara just proving that Dr. Servando’s Time Affect Tech called ”Sellafresh,” can ”extend the freshness of food 25 times longer,” astronauts can consume more calcium-rich moringa, spinach, kale, raw and cooked, longer. Plus it could keep ALL the Astronaut foods fresher and more flavorful. The U of Guadalajara in collaboration with Instituto de Technologico also found that Dr. Servando’s Sellafresh breakthrough made “the traditional laws of food preservation invalid.” See Timeaffect.com.This natural chemical-free way, based on physics and energy, is the New Frontier! Since sugar robs nutrients like calcium from the bones and organs and causes ups and downs and depression, organic stevia would be a wise sweetener since the recommended limit of sugar a day is 15 grams, and they now have delicious vanilla, chocolate and lemon. Plus the oranges and tomatoes floating around the space shuttles on YouTube looked conventional, despite First Lady Michelle’s inspiring organic White House Gardens. Since NASA admitted that ‘the view made up for the cuisine,’ and top restaurants around the world are serving organics because they also taste better, we wondered if they were aware that peer reviewed world studies found that organics had about three times more nutrients than conventional produce. In order to prevent Mexico’s healthcare system collapsing from diabetes, President Pena Nieto urged groups to come up with innovative solutions. And the Secretary of Health required our Vallarta Saludable (Healthy Vallarta) team prove that organics are a key piece. If the astronauts are eating pesticide laden fruits and veggies because they stay fresh longer than organics, again Dr. Servando’s “Sellafresh“ solves that with just a stamp or a sticker on boxes of produce and other perishables with the technology on it. Many space travelers also become deficient in iron, so our superfoods grown in the iron rich soil of Cabo’s Vortex would be more absorbable than supplements. Speaking of Ironmen, we just learned about the organic superfuel for the last 500 years of Mexico’s Raramuri Tribe of the Sierra Tarahumara Chihuahua, who are the World Champions for decades of the Ultramarathon 100 and 200 km race. Their “Pinoliya Secret of Life” is a combination of light, easily digestible organic superfoods grown there. While Mexico struggles with malnutrition, the University of Autonoma de Chihuahua’s study found that Mexicans who regularly consume this formula find “excess weight falls off, muscle mass and libido are enhanced, and diabetes can end after several months.” That is because this superfood formula that is an ancient genetic match synergistically builds up their nutrients, says Dr. Servando. So I was surprised that the astronauts’ recipes were not incorporating more synergistic combinations of superfoods other than quinoa and amaranth separately. Since this deserves more study, our Vallarta Saludable team is including Pinoliya in our 90 Day Diabetes Test. It will prove that through my delicious organic multi-superfood recipes and some Mexican ones enhanced with superfoods and US organic stevias, along with Dr. Servando’s nano tech that reverses dialysis and prevents amputations, 30 end stage diabetics will be off Meds and diabetes-free. Following a taste test of my superfoods for the MD hospital team requested by the Secretary of Health, they said it tasted better than the food making them sick. They then confided that they also have diabetes and insisted on being included in the 90 day test so they can do a better job. So when it comes to ending diabetes, taste matters. So there may be a great need and desire by space leaders, astronauts and guests for Cabo Corrientes’ delicious superfoods enhanced with nano-based quantum agri-technology, kept fresher and tastier with Sellafresh. Here are Dr. Servando’s advanced breakthroughs that require pure soil. Before I met him four years ago I never heard of Biodynamic farming, which works in more harmony with Nature and was developed in the 1920s by Germany’s Rudolph Steiner. Since they naturally replenish the original 70 minerals and 120 microorganisms in the soil, their produce has much higher nutritional benefits than organics why Biodynamic food is in big demand in Europe. See Google. Therefore, by our adding these technology breakthroughs to the rich soil in Cabo’s Vortex, we believe we are going to be producing the Healthiest Food for Astronauts, while also streamlining restoring the health of Vallartans, and by example Mexicans. President Pena Nieto also wants to be a stevia country like China and Japan that have low diabetes and violence in schools. As an underdog, seeing Mexico Rise from its diabetes epidemic can inspire other struggling countries. Our quantum physicist doc says that all plants, including fruits and vegetables, have energies stored in the empty space inside their atoms. So when we eat them that energy transfers to the empty space of the atoms of our bodies. Gurus and nutritionists recommend that we focus on positive conversations during meals to optimize our food as fuel. That is why Dr. Servando says our food grown in Cabo would give Astronauts better bio-energy and resonance from food to function better with the empty spaces in outerspace. His technologies include sound as a form of energy. If you listen to enough specific tones and pulses, the memories of your brain cell memories can normalize, which then stimulates and improves your biochemistry. It’s called Brain Entrainment. It is also important to understand the difference between Dr. Servando’s Time Affect Nano Technology and prescription drugs. The chemicals in drugs only temporarily change a cell’s biochemistry to give temporary “normalness” or relief of the symptoms, nothing lasting and unfortunately also toxifying the other cells and organs. He says that Time Affect heals the root of the disease by normalizing the energy/information filling the empty spaces of cells to delete memories of traumas and the data component associated with it. I asked him if his breakthrough is like giving our body cells a memory stick to download positive memories of a healthier earlier time to erase and replace bad memories. He said yes, by working within multi dimensions or inter-spaces of the atom! According to Dr. Servando, in the past, subtle light transmissions from far-off celestial bodies naturally provided the primordial data critical to enlivening our Earth and soil. This has been obstructed since the 1970´s, worsened in the 80´s to the point of complete obstruction and distortion since the late 1990´s. Since then this vital data/energy exchange has been obstructed and distorted to the point of blocked by the interference from satellites and space trash and ground-networks. A per se a SHELL is formed by this orbiting trash, ground-networks, power-grids, cellular communications, wifi, microwave ovens, light-pollution and especially the so called smart-meters, are severing many vital connections (in the form of subtle light transmissions) critical to enlivening Earth and its micro-systems within the soil. Due to all of these above systems our Earth has become de-natured and blocked from the energy/data needed to support and sustain life! When this energy/data is obstructed a dying-off or mutating is the result evidenced today with reduced beneficial micro-organism flora and increases in fungi taking over and attacking plants. There are also disturbing reports from around the world of decreases in organic seed germination being wide-spread. These vital microorganisms in the soil are critical for healthy forests and our food supply. Many forests in the U.S. and orchards like mangoes in nearby Nayarit have been destroyed because of insect invasions resulting from global warming. Dr. Servando says that today’s obsession with toxic technology, based on traditional science is causing huge disturbances to Earth and therefore threatening the future of humanity. He just came up with some ideas about how to economically clean up space junk, since these scrap metal alloys are worth a lot, why China is buying up alloy scraps all over the world. He wants to partner with the Mexican Space Agency and NASA, and ideally with Navajo Technical University that builds parts for NASA’s Space Stations, or any of the 70 Space programs who shares this concern. Native Americans especially care about living in harmony with Nature and the Universe, and many of the tribes like the Utes, Lakota and Cherokee know they are from this region. Mexicans are half indigenous and we are using their ancient superfoods like chia, amaranth, avocado, capomo, alo, ginger, nopal so it is befitting that Mexico leads this rebalancing of Earth and our relationship with the stars. Those who make this cleanup possible will be heroes to the World’s Children when they learn about all this. Given the movie Gravity showed this high amount of space junk, and I heard that they have to have technology to navigate around it, and with more and more satellite launches and collisions, this Space Junk Recycling Project would make everyone’s space experience more wondrous. Many Astronauts have become passionate protectors of our fragile magnificent planet, our only home! Fortunately, AGRI-Tech helps reconnect the soil with the cosmos sending this beneficial data to help restore life force in our soil and food, critical for deep space journeys. Dr. Servando says that most agriculture specialists are also NOT aware that the three most essential components to support germination, sprouting, rooting, growth, flowering and production are: Energy, Energy, and Energy. Primordially all energy is data-in-motion. From a simple seed sprouting to a bountiful harvest, nothing can be done without the energy (data or information) to do it. They amp-up the flow rate and concentrations of cosmic energies (primordial data streams) to enliven the soil and provide essential energies to support healthy plant growth. Quantum Agri-Amps are a virtual-particle/anti-particle technology that works on anthroposophical principles to re-establish and maintain vital, living, connections between Earth (your growing area) and the cosmos. Dr. Servando’s Quantum Agri-amplifier little machines (vibrantly metallic colored sacred geometric figures on pads) can double the size of the food and enhance its nutrition, delicious taste and aroma. Our Quantum Agri-Amplifiers are made of billions of nano and sub-nano sized antennas assembled in multiple-phased-arrays, receiving these weakened and distorted signals and sends them through our nano-circuits. Our nano-circuitry cleans them up, amplifies and directs these vital energy signals deep into the Earth to re-establish and maintain this living-connection. Our Quantum Agri-Amps tune this deadened, distorted energy back into harmonious life supporting energy which helps the Earth maintain a strong living connection with the forces of creation. The Amps are planted in mini-grid patterns (use instructions included) throughout your growing area, working 24 hrs a day for up to 9 years. Improve soil life, shown by increase worm count from avg 5-6 to 36+ in a month! The Vortex Super Spacefood Project can move forward right away, with or without waiting for the dam to be finished thanks to Dr. Servando’s Quantum Pulse Irrigation System. This amazing system is also for anyone wanting to be water wise, save precious water and the expense of irrigating, with his isochronic pulsed tones. Plus it results in even nutrient rich foods for astronauts and everyone. These isochronic pulsed tones on loudspeakers are a great gift to slowing Climate Change by growing crops without costly irrigation in drought challenged regions around the world like California so it eliminates the need for irrigation. Quantum tones could streamline regrowing burned forests as well as enhancing more snow at ski resorts by accelerating plant and tree growth that also bring up moisture from the aquifers in this beautiful cost-effective way. These isochrons stimulate stomata and heighten their activity endowing crops to uptake dew to meet most or all of their irrigation needs. These pulsed frequencies also stimulate rapid growth and draw more pollinators into the growing area while irritating all forms of insect pests that quickly leave the area. While somatic activity is heightened the plants can uptake the super-spectrum of our mono-atomic Foliar Spray to enhance flavor, color, nutritive potency and deliver special nutrients otherwise not available. See Full-Spectrum Nano Foilar-feed. Within 15 minutes of playing this “music” to your growing area you can witness your plants stoma activate and begin pulsing open and close over 30 times a minute! (Typical plants stoma open and close very slowly 1-2 times per sunrise – sunset cycle, in which the plant can exchange gasses with the ambient up taking its carbon and releasing oxygen). The increased stoma action produced by Quantum Pulse Irrigation endows the plant with the ability to uptake much more than atmospheric gasses. Every morning just before sunrise, dew forms and accumulates on plants leaves; even in the desert. Set a timer to turn on the pulse-wave daily at this time and play for 1 hour. Your plants stoma will activate to take in the dew and greatly reduce or eliminate the need for irrigation, conserving precious resources and the economic expense of running irrigation systems. The organic seeds that Vallarta Saludable would grow in the Cabo Vortex would be further enriched nutritionally and flavorfully by Dr. Servando’s Quantum Connection Seed Potentization. He does it by using quantum energy to stimulate the seeds of plants, as well as super nutritious fish eggs (inland farmed because of radiation in the Pacific) with frequencies for just 3 minutes. This changes their spatial energies and strengthens the linkages that growing in the vortices establish. Quantum connection seed potentization service is a proprietary quantum treatment for non–modified, open-pollenated organic seeds; which strengthens the seeds connection to quantum data streaming. Quantum Connection produces superior plants with rapid, balanced, healthy growth resulting in over 150% yield increases. The treatment produces more flowers, larger, more flavorful and aromatic fruits and veggies with increased vitality of the plant to strengthen resistance against drought and plagues. Dr. Servando also developed a chemical free mono-atomic element blend based that farmers or gardeners can use three time over growing season, which increases flowering, production yields and nutritional value. There is new market – Astronaut Food for the masses that boasts being “delightful to eat anytime… whether as holiday stocking stuffers, children birthday parties, on the trail or outer space exploring! Freeze dried fruits and other foods used by NASA since the early Apollo space program are still used by Astronauts on the Space Shuttle. A truly fun treat that the whole family will love, especially junior astronauts, with No refrigeration needed, is ice cream bars with a shelf-life of approximately 2 years. http://www.nitro-pak.com/freeze-dried-ice-cream/astronaut-space-snacks/astronaut-space-food-fruit-variety-pak-12-pak#sthash.5vykw74C.dpuf. Adding these amazing technology breakthroughs to Vallarta Saludable’s 12 Step Holistic Plan can further streamline reducing and preventing diabetes in Vallarta, which we estimated could save the city at least 12 billion pesos over three years. Since malnutrition is the cause of almost all disease, including diabetes and obesity, we want to find a way to make some of our amazing Astronaut Superfood from Cabo Corrientes with Agro Tech available for the masses. Might calling it ”Deep Space Superfood,” inspire malnourished kids in Mexico and around the world to go on an adventure with the Astronauts where few men or women have gone before? By learning about and joining the Astronauts in building up their nutrients so they can finally go into Deep Space, the Junior Astronauts can at Mission Control solve one of Earth’s biggest challenges, making diabetes history! Some call Vortices the “positive healing energy spots and the acupuncture points of Mother Earth.” She was officially recognized by the UN in 2009 to be a living, phenomenally compassionate being and we are all interrelated. At the Pyramids, Sedona and Macho Pichu Vortices, which the tribes call sacred sites, prayers are greatly multiplied, and Findhorn, Scotland plant size is doubled. 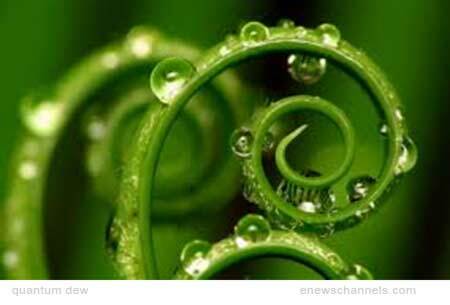 Read more science about these magical centers: 10 Vile Vortices Around The World. Yes, there are negative energy spots too. In 2004, Southern California’s 7 Year drought ended after the Big Bear Community asked tribal Elders for help. They led prayer groups at several vortices encircling the San Bernardino mountains. For more information on the Cabo Corrientes Vortex, or join an Astronaut Superfood Technology Tour that leaves from La Secrete Restaurant on Calle Berlin 103 (Francisco Villa), or attend an oceandance in Cabo, contact Carlos at von125@hotmail.com or call 322 2893987. Dr. Servando is excited about this Space project because it will also help him fulfill his dream of his Time Affect Tech helping prevent the greatest cause of death on Earth,(unnecessary)starvation, by simply extending the freshness of the world’s current food production 25 times longer. The Bishop of Mexico, inspired by Pope Francis’ Encyclical to follow Jesus example of feeding the poor, is looking at using it to help prevent 1.3 million Mexican children from starving each year. And the Cardinal at the Vatican in charge of the world’s largest foodbank, who had told the Pope that the only thing missing was the technology, is looking at it to help feed millions more. Powerpoint available or for more information contact Timeaffect.com. Article is Copr. © 2015 by Suzy Chaffee and originally published on eNewsChannels.com – all commercial and reprint rights reserved. Opinions are those of the author and may not reflect the opinion or policy of this site or its publisher. Content has not been edited beyond simple typo checks in order to retain the author’s unique voice.